Flowers, I love them! How about you? Are you out enjoying the sunshine and feeling the grass between your toes? 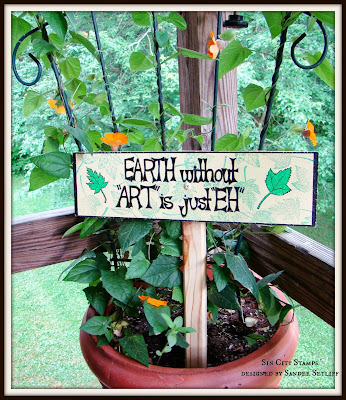 How about decorating that garden with a beautiful sign decorated with stamps? Yep, stamps aren't just for paper products, they can be used for outdoor projects too! First I started with a scrap piece of board that I painted with Deco Art's Chalky paint. Then I created a border around my sign using a black Sharpie. Next, I used Terri Sproul's Plate of Rubber Stamps "Leaves" to create a background with some green ink, randomly stamping a 3 leaf pattern. You can also use your stamps as a guide and paint them in like I did with the 2 accent leaves that are on the sides of the quote. The last thing I did was to attach my sign to the stake after a coat of varnish to make sure it was properly sealed. Love the sign they are so cute. love garden signs and the stamps are great. Love your sign what a fabulous idea..
Love it Sandee. I should make some like this for my nieces greenhouse. Great garden sign, and perfect for placing amongst the flowers! New idea for me to use them on signs. Thanks for the tip & great sign!